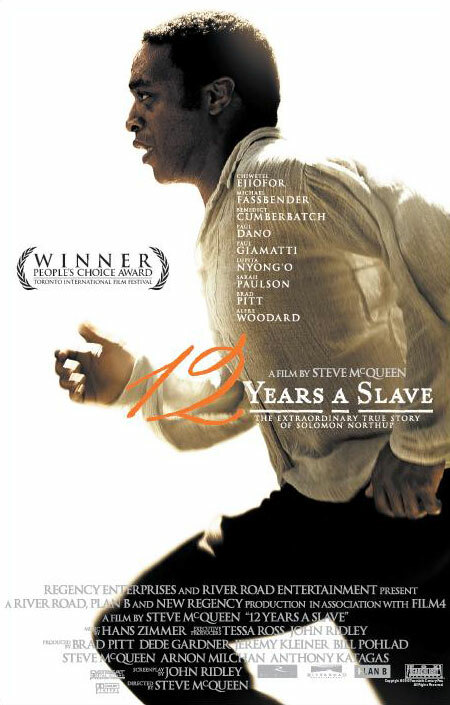 12 Years a Slave is one of the more interesting examples of films to take slavery as its theme in the last couple of decades. There is a preponderance of films about the American Civil War, but the era that went before it and the circumstances leading to the war are not so well documented. 12 Years a Slave certainly redresses this. As the story of a free black man from New York set in the antebellum of the American Civil War who is enslaved in the south for twelve years (ta-da! ), it clearly demonstrates a cause for the United States to grapple with the question of slavery in the 1860s, and in so doing fills a void in the dramatic canon on the subject. The film is beautifully shot, and though it oversentimentalises in the way most American films do, and occasionally glosses over the plot in favour of a clever turn of phrase, I can almost excuse these ills given the nature of the subject matter and the skill of the screenwright and director. The performances of the many well-known white actors in this film are likewise worthy of praise. Benedict Cumberbatch, Brad Pitt, Michael Fassbender and Paul Giamatti in particular provide a splendid bed for Chiwetel Ejiofor’s chilling performance as Solomon Northrup, and the equally empathic Patsey played by Lupita Nyong’o. But what I am most fascinated by is the persistence of the recent obsession of Hollywood with slavery. The theme is certainly relevant, with slavery continuing in many parts of the world today, and slavery bears some comparison with other social justice issues, but that doesn’t seem to be the motivation and I don’t quite know what to make of it. What seems most interesting about this modern slew of films about the American slave trade is that it stands alone, seemingly as a purely historical fascination, these films being almost entirely backward-looking. No allegories seem to be being made to more modern struggles like feminism or marriage equality, though they’d be easy references to make. The filmmakers seem to be ignoring the more recent practice of slavery, which continued well into the twentieth century even where it was ostensibly banned (for instance, Queensland and the British outposts in southern Africa), and more oddly in those places where slavery has continued into the twenty-first century. These films don’t seem to be making much of a stand against modern slavery or against any modern societal ill in the way that stories such as The Crucible clearly denounced the persecution of Communists in the 1950s. They seem to sit merely as a historical account, and although they reinforce the anti-slavery position of the United Nations, they seem to be have little point beyond this, so I am surprised at the continuation of the theme. Regardless of the reasons for these films, their quality is stunning. I just hope they find a purpose if they’re going to keep making them.